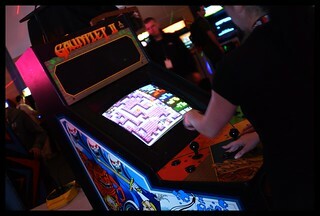 One of my favorite spots at PAX East was without doubt the room organised by the American Classic Arcade Museum. ACAM is based in an amusement center called Funspot in New Hampshire, but had shipped some of their classic cabinets up to PAX for people to try. The room brought back all kinds of early gaming memories! They didn't actually have any real arcades where I grew up in Ireland, so my experience with them was limited to holidays and trips abroad, which kind of made them all the more memorable for me as a kid growing up. I'm not sure what would have happened if I'd had constant access to these cabinets! The fact that getting to play them was somewhat of a special treat however only strengthened the memories. I am sure I wasn't alone either, you could almost taste the nostalgia for many of those wandering around the room. Thankfully the kind folks at PAX had a constant supply of fake quarters in ready supply to make sure that you could play to your hearts content. 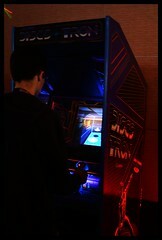 What's more is that it was great to see the younger generation also enjoying the cabinets. In these days of high definition graphics and virtual worlds, there is something reassuringly endearing about knowing that games will have a universal appeal whatever form they take. 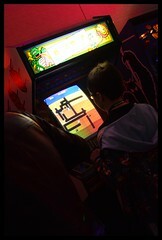 So whatever gaming generation you hail from, if you are ever in New Hampshire and feel like a good old school gaming experience, make sure you check them out. Getting nostalgia pangs just reading.